The "Dean of American stamp designers" was a prolific artist and book and magazine illustrator; between 1947 and 1962 he is considered sole designer of 60 U.S. postage stamps, the best known being his 1962 "Project Mercury" 4-cent stamp, and was closely involved in the creation of 77 stamps. Signed Postal Cover, 6½" X 3 3/4", cancelled on the first day of issuance (20 February 1962) but not at the official place of issuance (Cape Canaveral, FL), but rather in Salisbury, NC. Fine. 4-cent "Project Mercury" stamp at upper right and large rubberstamped outline of John Glenn's space capsule at left. Chickering signs boldly in full in blue ballpoint at lower left, above the typed statement "Mr. Charles R. Chickering / designed Project Mercury stamp." While John Glenn signed a great many First Day Covers of this stamp, Chickering signed few and they are surprisingly uncommon. This Polish-Jewish artist, illustrator and cartoonist fled Hitler's persecution but enjoyed skewering him in his 1941 book "The New Order"; a superb miniaturist and manuscript illuminator, his prints and book illustrations often bear a resemblance to stained glass windows and medieval illuminated manuscript leaves. Partly-Printed ADS, 1p, 6¼" X 2 3/4", New Canaan, CT, 20 November 1948. Near fine. Bank check drawn on The First National Bank & Trust Co., made out in Szyk's handsome printing to "Cash" in the amount of $27.00 and handsomely signed at lower right. On the verso he signs a second time. Usual bank cancellation perforations, not touching signature. A lovely twice-signed example dated just six months after Szyk attained American citizenship. "The Mountain Boys" hillbilly cartoons became this Connecticut artist's syndicated path to fame, published in such magazines as "Life," "New Yorker," "Judge," "Colliers" and "College Humor" and collected into such books as "Comin' Round the Mountain" (1938) and "Keep 'em Flying" (1941). ALS, 1p, 5 3/4" X 9½", New Canaan, CT, 8 October 1935. Addressed to Mr. Milkman. Very good. Boldly penned in brown ink in Webb's large, broad script, the cartoonist jests with an admirer that "I have a hobby too -- I spend so much of my time on this particular hobby that I really accomplish very little. I would have answered your letter sooner if it hadn't been for this said hobby. If I can ever make enuf money to retire I'm going to spend my whole time at it -- I won't keep you guessing any longer -- it's sleeping." Nicely signed -- and a lovely example from early in his career. This German-American artist and illustrator contributed to "Harper's Weekly" as a young man and also did book illustrations for Sidney Lanier and others; he lived in a New York tenement building with African-Americans, who often figure prominently in his oil paintings; in 1893 some of his work was exhibited in Chicago at the World's Columbian Exposition. ALS, 1p, 7½" X 8 3/4", New York, NY, 13 May 1877. Addressed to Frank L. Robinson. Very good. Bit of mild wear. Boldly penned in black ink, Kappes writes to what's presumably his agent or an art gallery owner: "Should the prices affixed to my pictures retard the sale in any respect, you can make such reductions as you may think proper. I should be loath to part with them at a greater reduction than 25 per cent. If you will kindly consider this as the maximum...." Scarce. Kappes autograph material is seldom seen. British artist celebrated for his vibrant paintings of fruit and flowers, though he also produced historical scenes such as the prize-winning "Melancthon's First Misgivings of the Church of Rome"; some credit him with single-handedly reviving interest in still lifes, and no less than J.M.W. Turner called him one of the three great colorists of his age. ALS, 3pp (lettersheet), 4½" X 7", London, England, 21 November 1845. Addressed to "Sir" (Robert Vernon, Lance's best and earliest patron who collected many of his works and formed a collection that became the nucleus of the Tate Gallery, now Tate Britain). Very good. Mounting traces and small chip to blank fourth leaf. Gracious note boldly penned in brown ink helping a young fellow artist, reading in part: "The bearer of this note (Mr. Saddler) whose talent I think you will much admire, is very anxious to be hired as a labourer in the Vernon vineyard. He not only engraves but draws architectural subjects beautifully, and it struck me you might find him of assured value in getting out the pictures by Roberts...." On another (and sore) subject, the election to the Royal Academy that never came his way to the surprise of the London art critics, Lance writes: "Another year is passed over and your friendly remarks have not helped me at the Academy -- twelve years consecutive have I been a candidate -- My chief regret is that it looks like a dishonor placed upon this branch of art...." Some speculate that Lance was denied membership because of political differences with the establishment and a squabble over the "Royal Boar Hunt" by Velazquez at the National Gallery and Lance's role in restoring that painting. An excellent example with superb content showing Lance's advocacy of young talent and disappointment at rejection by his peers. This American artist became quite popular in the 1920s for his celebrity caricatures published in "The New Yorker," "Vanity Fair," "Harper's Bazaar," "Collier's" and "Judge" as well as book illustrations, but mental illness led to his suicide at age 39. Good content TNS, 1p, 8½" X 11", New York, NY, n.y. February 9. Addressed to "Mr. MacDonald (Pirie MacDonald, 1867-1942, noted "Photographer of Men"). Very good. Faintly age toned, with signature easily legible but a tad light. The artist thanks the portrait photographer: "... I am hugely pleased with the photograph of me. Everyone who has seen it (some fifteen people or so), from my mother to two of your closest rivals among photographers, raves about it. It is a fine piece of work as a photograph without borrowing from any other art." Sharp example of this uncommon autograph. The tiny western Massachusetts town of Stockbridge -- best known as Norman Rockwell's home town -- had a vibrant art colony of painters and sculptors in the late 19th and early 20th century, Daniel Chester French a leader among them; prominent among them was this artist, known mainly for her portraits. ALS, 3pp (lettersheet), 5" X 6½", New York, NY, n.y. April 9. Addressed to Mrs. Stowe (Hilda Robinson Smith Stowe, 1881-1965, wife of Harriet Beecher Stowe's grandson, Lyman Beecher Stowe). Fine. 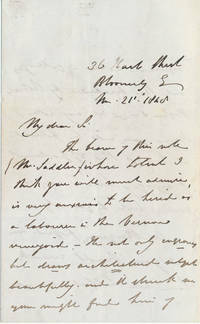 On stationery bearing her printed "77 East Eighty-Ninth Street" address, Kobbe expresses doubts "about David's picture" -- Stowe's son David Beecher Stowe, born 1916 -- noting "I... feel that you are a little disappointed in it -- I cant expect to be perfectly satisfied with the way a portrait is done but at least you must be perfectly satisfied with the likeness. Dont hesitate to say if you are not satisfied... if you want me to try again, we can arrange perhaps to meet in Stockbridge some time this summer -- your little boys are especially dear & I want to do something that is like their quality." Flamboyantly penned in black ink and boldly signed. This German-born American artist and sculptor circulated among the elite avant garde modernist circles of Europe (with Gertrude Stein and Pablo Picasso) and America (with Alfred Stieglitz and Georgia O'Keeffe); he's best known for lithographs of New York cityscapes and, later, of Colorado and New Mexico scenes, as he moved west and briefly served as art director of the then-new Denver Art Museum. ALS, 1p, 8½" X 11", Denver, CO, n.y. Addressed to Arnold F. Gates (1914-93, noted Lincoln/Civil War scholar). Near fine. Excellent content penned in his bold, handsome script in brown ink, reading in part: "In answer to your question: 'have you ever turned out a Lincoln head or bust?' I can only say that for years I have had a bust of that grand head in my mind, -- (and, in my opinion, it is one of the most plastic faces of really great men) -- but I have not yet have had the opportunity to execute it. -- May I ask why you asked me that question?" Undated, but certainly of mid-1930s vintage. Quite handsome -- and quite uncommon. The "Father of the American Cartoon" was a German-born American cartoonist who proved the influence of editorial cartoons with his memorable attacks on William M. "Boss" Tweed and the Tammany Hall political machine along with all manner of events during the post-Civil War decades, mainly for "Harper's Weekly" but also other popular periodicals; he's credited with creating the Republican elephant, but he merely popularized the Democratic donkey and Uncle Sam; on a lighter note, he's considered the creator of our modern image of Santa Claus. Original ink drawing, heavy stock 8½" X 10½", n.p., n.y. [ca. 1897]. Very good. Mild edgewear and mild age toning, with single small chip at upper right corner. 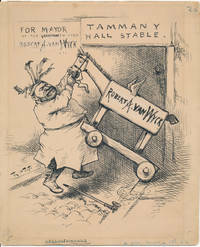 Delightful example of Nast's campaign against the Democratic political machine known as Tammany Hall. Tammany Hall leader Richard Croker engineered the election of Robert A. Van Wyck (1849-1918), a Democratic politician whose strings Croker could control. Van Wyck's single term (1898-1901) was marked by little but the "Ice Trust" scandal of 1900 in which Van Wyck was implicated and which caused his political ruin, making him a one-term wonder. In this bold scene penned during Van Wyck's 1897 campaign, Croker is shown wheeling a large toy hobby horse (labeled "Robert A. Van Wyck") out of the gate of the "Tammany Hall Stable" onto a cobblestone lane; in the background one can read a political poster text ("FOR MAYOR / of the Greater New York / ROBERT A. VAN WYCK"). Along the bottom edge Nast pens the title "Afraid of His Mare." Signed boldly with his usual "Th: Nast" signature alongside the likeness of Croker. Bottom corners each bear tiny pencil and blue pencil editorial marks, as does the verso. Fascinating is that both appearances of Van Wyck's name show subtle scraping -- suggesting that Nast had originally drawn this cartoon with another candidate's name in those spots, which he later scraped out and replaced with Van Wyck's name once that politician had been named! The reference to "Greater New York" is also of interest, since Van Wyck became the first mayor of the newly-created five-borough "greater" New York. Nast cartoons with Tammany Hall content are among the most desirable, and this is a superb example of his bold draftsmanship. This American artist painted dream-like landscapes with Rubinesque nudes, and though Marcel Duchamp "discovered" and championed him in 1917 -- his work went over well in Paris -- American audiences disliked his eccentric fantasy work and he turned to poetry and composing; one of the more bizarre figures in a field full of characters, he was born into wealth but died a pauper. 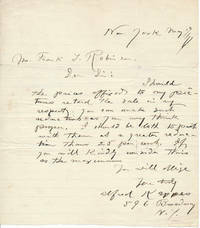 ALS, 2pp (single leaf), 8½" X 11", New York, NY, 1 March n.y. (ca. 1936). Addressed to Beth Newman. Very good. Lightly age toned. Below his printed name and address, Eilshemius sketches an elaborate vignette with ornamental scrollwork about the edges, penning "Mrs. Beth Newman" at center and signing "Eilshemius" at its lower right. 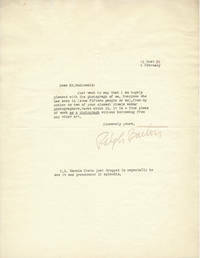 Chatty letter regarding his music compositions, reading in part: "The music is on way to Beverly Hills. Am so glad that your husband enjoyed the pieces and has honored me to put a few of them into Quartett form. No I have no phonograph therefore a record would be of no use. We have no electricity in this house, old as the hills, you Know. Am sorry I can't hear your husband play them on the piano. I do not Know any professionals here, must be bereft of any playing Ah! Me! You are lucky to have a precious babyboy and to enjoy the track. Does your husband perform for the Mike, I wonder.... I have 50 ptgs. at the Frisco Art Museum on view. Also, one a genre at Pittsburgh Carnagie...." Boldly penned and signed in full in black ink. Excellent content showing two of his passions, his art and his music. Beth Newman was the first wife of Hollywood composer and music dynamo Alfred Newman (1901-70), film composer extraordinaire and winner of nine Academy Awards. This Austrian painter, sculptor and printmaker was a surrealist who has been described as "the first psychoanalytical painter," but it is for co-founding the Vienna School of Fantastic Realism in the late 1950s together with Ernst Fuchs, Holfgang Hutter and several others that he's best remembered. Color PS, 5 3/4" X 4", n.p., n.y. [lightly pencilled February 1986 on verso]. Near fine. Glossy heavy stock reproduction of Hausner's 1948 surrealist painting "Forum der Einwartsgewendeten Optik" from the Historical Museum of the City of Vienna, signed large and bold in blue ballpoint along the blank lower margin. A superb example, and seldom found in this form. This famed French painter was an academic painter celebrated for his depictions of historical Oriental and classical Greek and Roman scenes. PS, heavy stock 2½" X 4¼", n.p., n.y. Near fine. Rounded corners (as issued). 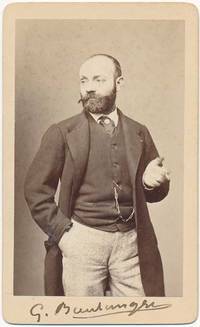 Outstanding carte-de-visite half-length portrait of Boulanger in three-piece suit and tie, right hand in pants pocket and left hand dramatically foisting a cigarette. Sharp backstamp in brown of photographer Bingham in Paris. On the blank margin below his portrait, Boulanger signs boldly in brown ink with his usual crabbed "G. Boulanger." Undated, but likely circa 1870. A superb example -- and quite scarce. Whitman Publishing Company's local "go to" artist and illustrator is credited with many of this Racine, Wisconsin's colorful kid's books of the 1920s, such as "Conqueror of the Sea" (1924), "Stories Told at Bedtime" (1925), "Tabby Cat and Kitty Cat Make Friends with Billy the Goat" (1925), "Charles Dickens' The Story of Tiny Tim" (1926), "The Cozy Book of Mother Goose" (1926), "The Nightingale from Far-a-Way China" (1926), "The Children's Story of David Copperfield" (1926), "The Story of Peter & Prue" (1928) -- and his own book "The Birds We know: Color paintings by Ray Gleason" (1928). ALS, 2pp (separate leaves), 8½" X 11", Racine, WI, 12 April 1933. Addressed to John G. Leiser. Near fine. 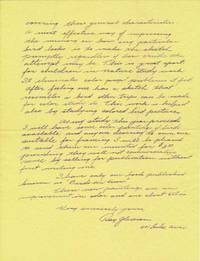 On bright yellow onionskin-type paper penned in vibrant purple ink, Gleason writes this admirer, an Illinois school teacher, with advice about studying and painting birds. In part: "I am happy to hear that you love to study birds and that you have a nature study class. To me, the study is a great source of pleasure. I try to see in the study of birds symbols of the wonders of all nature. I try to bring thru their study a harmonious relation of the contradictory elements of experience. Hence my preoccupation is with the physical reality of my medium, color and drawing, thru the character of the motive I try to proportion into pleasurable relations the color with the various forms and in harmony with associations we thru common experience, bring to it. Probably nothing delights the eye o man more than a beautiful bird, and for the past several years I have found great pleasure in going out early in the morning sketching birds. In order to paint any particular bird one must first study for size, proportion, character, color, etc...." Goes into much further detail on painting birds, noting near the close "I have only one book published known as 'Birds We Know" and signing boldly. 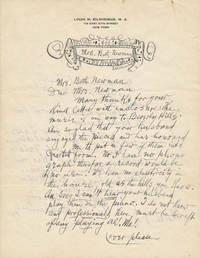 With original envelope, addressed in Gleason's hand and signed again by him. Superb, meaty content for the bird artist aficionado. This American cartoonist supposedly created more than 24 comic strips (including "The Inventor," which ran from 1904 to 1914) and assisted with four others; one cartooning historian describes him as "an absolute whirling dervish at the drawing board, producing more material for the daily pages than anyone except the great George Frink'; he worked for the "Chicago Daily News" (ca. 1908-24) and the "New York Herald-Tribune" (1925-42). On a heavy stock 5" X 3" card, the cartoonist pens "Sincerely yours" and signs in cursive, adding his cartoonist's printed, stylized "T. Brown" alongside. Very good. Faintly age toned, with mounting traces on verso. Along the bottom edge is typed "Cartoonist 'Chicago Daily News'. / April 29, 1922." Very uncommon. This English artist exhibited the usual classical and literary themes at the Royal Academy and other distinguished venues, and even dabbled in illustration art briefly, but before long realized that painting animals of all sorts was his true vocation and this he did for much of his long career. Brief ALS, 2pp (lettersheet), 4½" X 7", Flaxley, England, 4 February 1887. Addressed to "Dear Madam." Penned in brown ink in his usual hurried scrawl, Riviere here sends "regret that it is not in my power to assist your undertaking. Owing to the state of my health I have been obliged for many years to limit very closely my hours of work & to confine myself entirely to such work as the exercise of my profession...." A nice example. What Bill Mauldin and "Willie and Joe" were to World War Two G.I.s, "Wally" Wallgren and his "Helpful Hints" cartoons in "Stars and Stripes" were to World War One doughboys, for both poked fun and army life, army chores, army regulations and the drudgery of military life; Wallgren served with the 5th Marines in the First Division in France, after the war collecting his cartoons into the popular "Wally: His Cartoons of the A.E.F." in 1919; later he cartooned for "American Legion Magazine" and then had another strip called "Hoosegow Herman." Original ink cartoon, heavy stock 4" X 7" sheet, n.p., n.y. (Wallgren's Drexel Hill, Pennsylvania home address lightly inkstamped on verso). Near fine. Wallgren signs simply "W" at lower right, and though not dated, an inkstamped 15 March 1943 on verso is perhaps the date on which this appeared in "American Legion Magazine." Two serviceman in uniform stand at center perusing this magazine, the soldier at left asking "Wot's 'savvy our lingo' mean?" and his pal at right replying "It means we talk the same language!" 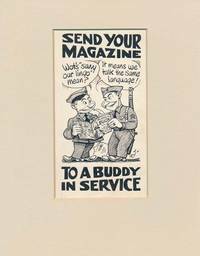 Caption inked quite large both above and below this scene remarks, "SEND YOUR / MAGAZINE" (at top) "TO A BUDDY / IN SERVICE" (at bottom). Displayed in cream 7" X 8½" mat with 3¼" X 5 3/4" opening. What Bill Mauldin and "Willie and Joe" were to World War Two G.I.s, "Wally" Wallgren and his "Helpful Hints" cartoons in "Stars and Stripes" were to World War One doughboys, for both poked fun and army life, army chores, army regulations and the drudgery of military life; Wallgren served with the 5th Marines in the First Division in France, after the war collecting his cartoons into the popular "Wally: His Cartoons of the A.E.F." in 1919; later he cartooned for "American Legion Magazine" and then had another strip called "Hoosegow Herman." Original cartoon in black ink, signed simply "W" at lower right, heavy stock 7" X 3¼" sheet, n.p., n.y. [Wallgren's Drexel Hill, Pennsylvania home address lightly inkstamped on verso). Near fine. Charming scene -- perhaps a "Helpful Hunts" installment -- depicting two soldiers side by side at a table, the G.I. at left showing the G.I. at right how to open a bottle of French wine. "See!!" he says as he thumps the underside of the bottle and the cork strikes with a "Pop" in his friend's eye. Cream 8½" X 6½" mat with 5¼" X 2½" opening. Wallgren's early work is surprisingly scarce, and this is a delightful example. This two-time Pulitzer Prize-winning editorial cartoonist created the immortal Willie and Joe during World War Two; his 1963 "Grieving Lincoln" cartoon in the "Chicago Sun-Times" summed up the nation's reaction to JFK's assassination. TLS, 1p, 7¼" X 10½", Santa Fe, NM, 1986 April 14. 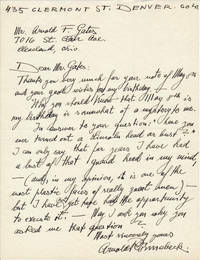 Addressed to "Ralph" (Ralph G. Newman, 1912-2000, founder of Chicago's famed Abraham Lincoln Book Shop). Near fine. 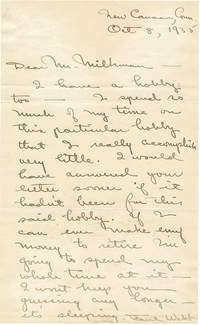 On his imprinted stationery, Mauldin complains at length and in detail about the treatment he received from the Library of Congress about a quantity of "my stuff" they had on deposit. In part: "The other day a freight truck arrived with two metal boxes plus two cardboard boxes plus a huge filing cabinet. Contained therein was a general jumble of stuff: old letters, old drawings, and God knows what. And I do mean jumble. I think the filing cabinet must have made the trip standing on its head. I had asked the people at the Library... to have the metal boxes banded. They were lackadaisically taped with single strands of fiber tape about 3/4" wide. The cardboard boxes had been taped in the same manner, by somebody who clearly knew nothing of security, and were in unbelievable condition. Whole corners were ripped out, big enough to have leaked half the contents. We will never know if there is a paper trail from here to Washington or Maryland or wherever the hell it came from...." Boldly signed in blue ballpoint. 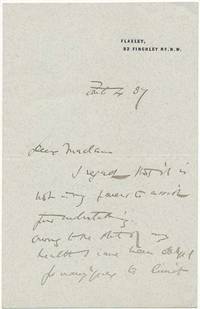 Mauldin is quite scarce in content letters -- and Newman the Lincoln expert acted, of all people, as Mauldin's literary agent. 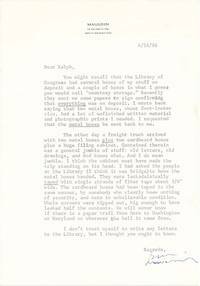 Mauldin sent fewer and fewer letters after World War Two and, especially later in life, grew increasingly isolated, corresponding with very few people -- hence the extreme scarcity of his letters. Accompanied by an unusual Mauldin-Newman joint venture: a heavy stock 11" X 14" print of the cartoonist's famed "Grieving Lincoln" editorial cartoon, pristine and housed in its original white presentation envelope (captioned "A Keepsake by Bill Mauldin from the Abraham Lincoln Association, 12 February 1989"). A superb pair. Mauldin was very protective of reprint rights to his work, and only because of his close personal connection to Newman did he allow this moving drawing to be reproduced. This American artist was an illustrator for "Harper's Weekly" and other publications and also illustrated many books, but is best known for drawings and painting of American and European street scenes -- cityscapes, buildings. Signed leaflet, heavy buff stock 6" X 9", 4pp, n.p., n.y. Fine. 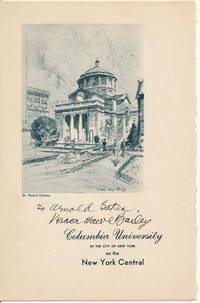 Reproduction of Bailey's lithograph of St. Paul's Chapel, with printed caption beneath "Columbia University / in the City of New York / on the / New York Central." Just below the image the artist boldly inscribes "To Arnold Gates" and signs in full in black ink. Inner pages (2 and 3) blank, and fourth page features two columns of text about Columbia University (front and rear pages thus display nicely side by side). No publisher or year noted, but likely of 1930s vintage and presumably a New York Central marketing piece. Arnold F. Gates (1914-93) became a noted Lincoln and Civil War scholar.